Did Halloween give you a sugar high? If not, let me bring something sweet to your attention. 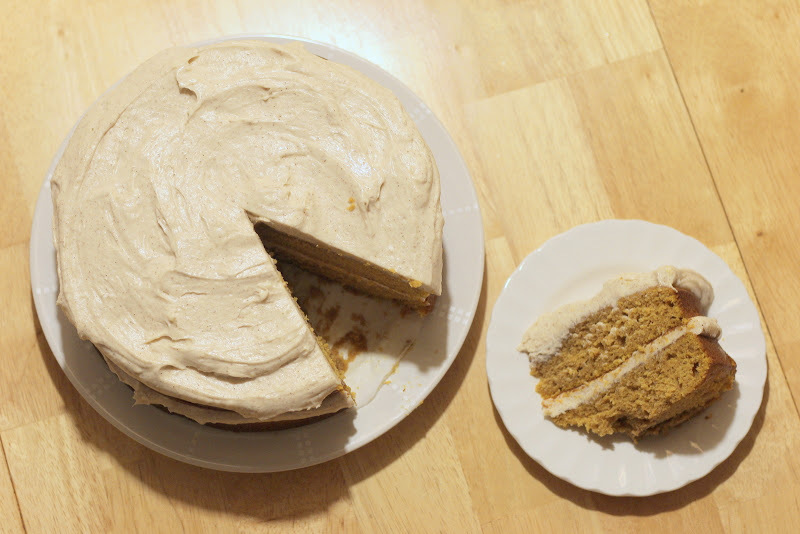 I know that pumpkin this and pumpkin that are everywhere, but please don’t tell me you’re sick of pumpkins because you have to try this cake. 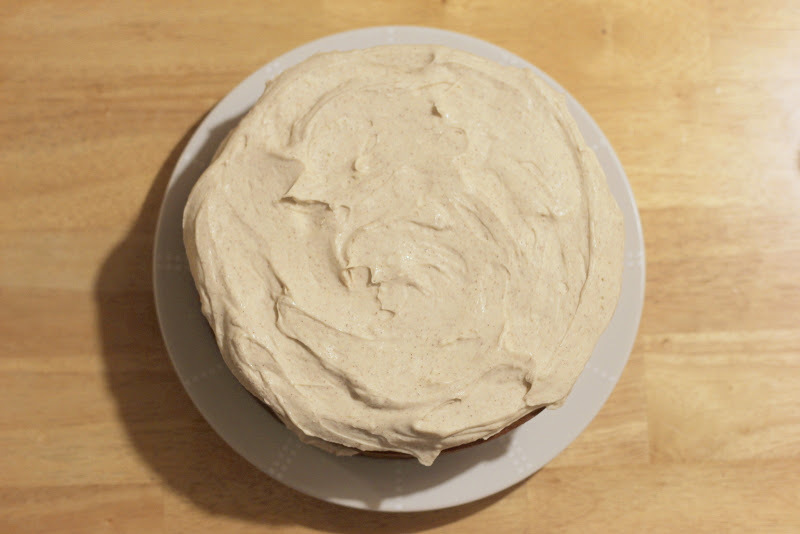 It has the perfect amount of spice and if you like cream cheese frosting as much as I do, you will love the kick of flavor that the cinnamon gives. I swear this cake is good! It’s definitely a contender as one of the best cakes I’ve baked from scratch. Once you dig a fork into a slice, you’ll understand what I mean so go, go make it. Hope you’re having a nice weekend! Can you believe it’s November? 1. Preheat oven to 350 degrees. Butter 3 9-inch round cake pans (I used 2 cake pans) and line bottoms with parchment paper, butter parchment and set aside. 2. In a mixing bowl whisk together flour, baking powder, baking soda, salt, cinnamon, nutmeg and ginger for 20 seconds, set aside. 3. In another bowl, whip together butter, granulated sugar, brown sugar and 3 Tbsp of the vegetable oil with an handheld mixer until pale and fluffy. Mix in remaining 1/4 cup + 1 Tbsp vegetable oil. Blend in eggs one at a time, adding in vanilla with last egg. 4. In a bowl or large liquid measuring cup, whisk together pumpkin with milk. 5. Working in three separate batches, beginning and ending with flour mixture, add 1/3 of the flour mixture alternating with half of the pumpkin mixture and mixing just until combined after each addition. 6. Divide batter among prepared cake pans and spread batter into an even layer. 7. Bake in preheated oven until toothpick inserted into center of cake comes out clean, about 30 – 35 minutes. Cool in cake pans 15 minutes, then run a knife around edge of cake to loosen and invert onto wire racks to cool completely. 8. 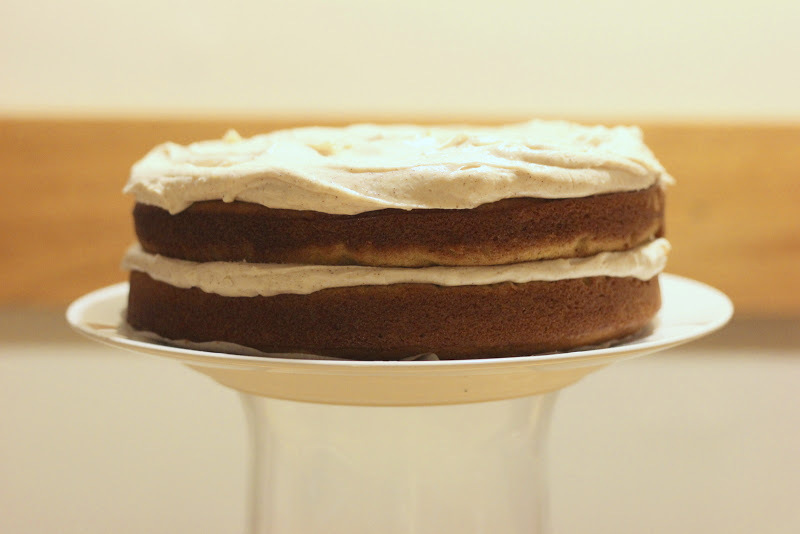 Once cool frost cake with cinnamon cream cheese frosting. Store cake in an airtight container in refrigerator. 1. In a bowl, whip together cream cheese and butter until smooth and fluffy with an handheld mixer. Add cinnamon, vanilla and powdered sugar and mix on low speed until combined, then increase to medium and whip until pale and fluffy.